Please click here for the current models. 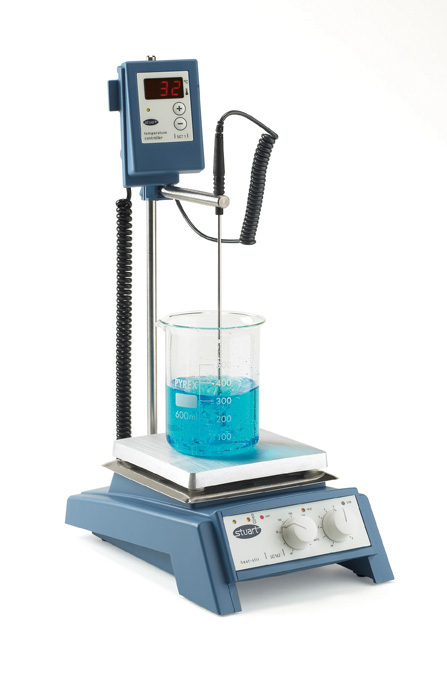 The SC162 and CC162 hotplate stirrers are specifically designed for use with the Stuart SCT1 temperature controller. Available in a choice of either robust aluminium or chemically resistant ceramic top, each is equipped with a range of advanced safety and communication features. To alert the user, a "Hot" warning light will flash whenever the plate temperature is above 50°C, even when the hotplate is turned off and connected to the mains. The cast aluminium body is shaped for stability and helps deflect spills away from the controls. An Independent safety circuit prevents overheating in the event of control failure and internal electronic components are protected against corrosion. Powerful magnets and motor give stirring speed up to 1500rpm and volumes up to 15 litres. The units automatically detect when the SCT1 temperature controller is plugged in. Communication with the SCT1 temperature controller is visible by an illuminated LED on the hotplate, providing reassurance that the temperature of the sample is precisely controlled at all times. 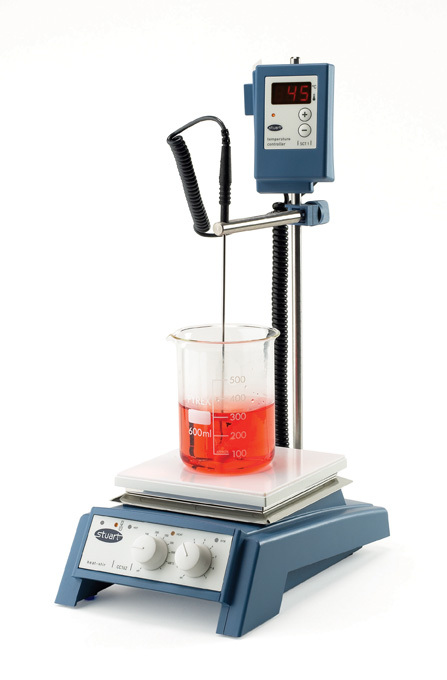 Both CC162 and SC162 models can be used independently of the SCT1 temperature controller as a general purpose hotplate stirrer. Model CC162 has a glass ceramic top, which has excellent chemical and temperature resistance. The surface is easy to clean and the thermal properties allow very high plate temperatures. Model SC162 has a robust aluminium/silicon alloy top plate for good heat transmission. A 700W element gives rapid heating and ensures even temperature distribution across the whole of the plate. CC162 - Stirrer/hotplate, ceramic plate, probe socket. SC162 - Stirrer/hotplate, aluminium plate, probe socket.